If you have ever made any attempt to research or collect Disneyana, you know that it is a very vast collecting field and that Disney will put its name on just about any product. I don’t even want to attempt to think about how many products Mickey Mouse has had his face put on over the past 84 years. It is mind blowing. With all of that constant merchandising, you might think that pretty much every major Disney film, character, and TV show has been heavily merchandised, but some have been known to fall through the cracks. The 1970’s is a great example of a decade where several major projects that Disney churned out went practically unmerchandised, despite being decent movies (though probably not as good as previous Disney movies) that a lot of kids loved. The 1970’s was a strange decade for Disney. Walt himself had passed away in 1966, and the company struggled to regain its footing after he was gone. Not everything Disney did in the ‘70’s was bad, but the quality just wasn’t quite what it had been in previous decades. Because of these struggles, I think Walt Disney Productions failed to market its 1970’s features half as well as it had marketed movies in the past. A prime example of this was 1971’s Bedknobs and Broomsticks. It was a major motion picture with a decent cast of colorful characters, and yet only one toy was ever made for the film. That toy was the Bedknobs and Broomsticks Action Bed. This toy was made by Horsman in 1972, and was based on the magic bed in Bedknobs and Broomsticks. I don’t know if Horsman ever planned to make dolls of any of the other characters from the movie, but by not making anything else they really limited the play value of this toy. The bed is battery powered. When you switch it on, it rolls across the floor, and when it bumps into things, it switches direction and keeps going. A bed alone would have been super lame, so they did produce a single doll that came with it, a doll of Angela Lansbury’s character in the movie, Mrs. Price. I know what you are thinking. That doll looks exactly like Angela Lansbury! No? Well, it was the ‘70’s, and toy companies really didn’t care if they made their toys look exactly like the person they were representing. 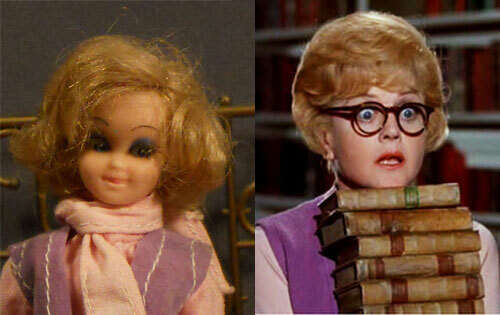 I guess kids had more imagination back them and didn’t need their doll to look exactly like Angela Lansbury. Personally, I think the fact that it really looks nothing like Angela Lansbury adds to the charm and wackiness of the toy. At least they got the outfit sort of right so you have some idea who this doll is supposed to be. My example, which my brother gave me for Christmas a few years ago, came with a messed up box. I still have some panels from the box, but my example is basically a loose, but unplayed-with example. Still, it is a very rare toy, so I’ll take what I can get. Honestly, I wanted a loose example anyway, so it all worked out. The box is all plastic except for a cardboard base for the bed to sit on, so it is very fragile. Boxed examples do come up every now and again though because I believe this toy was a slow seller, and a lot of the existing examples are old store stock or simply never got played with. You know, it’s the type of toy a grandparent or weird aunt who doesn’t know what you are really into gives you, and you politely thank them and then shove the toy in a closet and forget about it. Let’s face it, not every kid in 1972 was jonesing for an Angela Lansbury action figure, and with no other characters from the movie to choose from, I think this toy was pretty much a flop. However, it is a fascinating little piece of history from the time when the Disney Company was going through its awkward post-Walt Disney phase. Honestly, Bedknobs and Broomsticks is not a bad movie. It is better than a lot of the live action movies Disney had produced in decades prior to the 1970’s. Unfortunately, it exists in the time period between The Jungle Book and The Little Mermaid though, so it doesn’t really get the attention it deserves. Today this toy appeals to Disney fans as well as collectors of TV and movie dolls and battery-op toys, so it is fairly desirable. It also appeals to people with cheeky senses of humor who giggle at the thought of Angel Lansbury on her “action bed”. Even though I enjoy Disneyana, I would be lying if I said that my sense of humor didn’t factor in to why I wanted this toy. 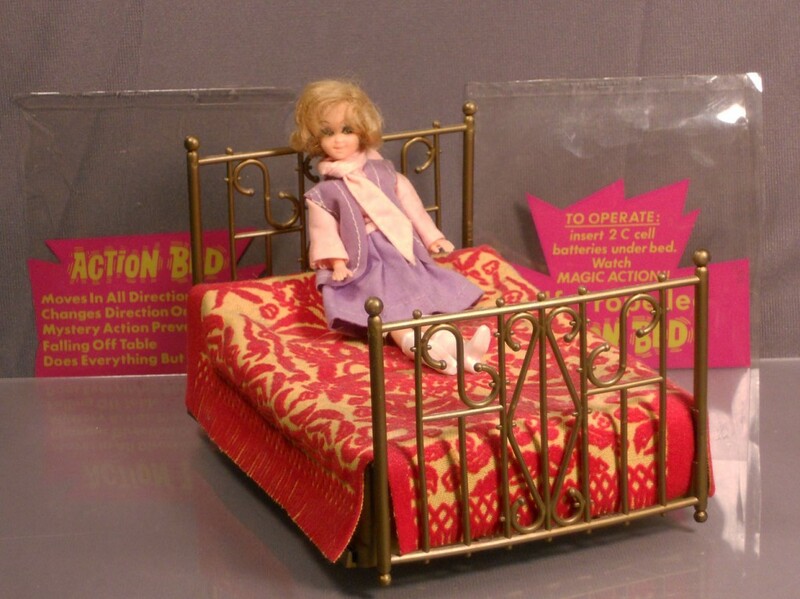 The Bedknobs and Broomsticks Action Bed is a prime example of “What were they thinking?” marketing. Only making a toy of one character from a movie with a large ensemble cast – what were they thinking? Choosing Angela Lansbury instead of the relatable-to-children kid characters from the movie – what were they thinking? Making a toy of a mature woman on a vibrating action bed – seriously, what were they thinking?!? The Bedknobs and Broomsticks Action Bed certainly is a special unicorn galloping through the vast field of Disney collectibles. This entry was posted in 1970's, Amy, Disney, Dolls, Toys. Bookmark the permalink. I’m glad that you posted photos of the actual doll from this rare set! By including only Eglantine Price with her bed, Horsman was teaching kids about “the personal habits of lonely, 40-something women”…by being subtle! LOL! Had that movie been released during about the mid-1980s, kids might have gotten the subtlety…of Horsman’s “marketing strategy”… 😉 JK, with regards to my comment about Horsman…I HOPE! Really, though, any way by which Horsman sliced THAT pie, they were guaranteeing that their new toy was going to be looked at strangely…by SOMEBODY or another…but, then again, “Bedknobs and Broomsticks” WAS a strange, cool, sort of early Goth(? )-flavored movie. I like to think of Horsman’s “Bedknobs and Broomsticks” Action Bed set as a friendly reminder that “Bedknobs and Broomsticks” was/is a cool movie! If I owned that set, I’d keep the bed, and the doll outfit, but I’d replace the doll with a blonde Bubble Cut Barbie, as I think that she resembles Angela Lansbury as Eglantine Price (Fairly fit figure, but “old-fashioned”…new, by 1940s standards, hairstyle). Thanks again for the cool memories that I was, unfortunately, not born in time to experience…(I was a baby of the late 1970s).